Mervat Abou Oaf’s journey of success has been quite unique. 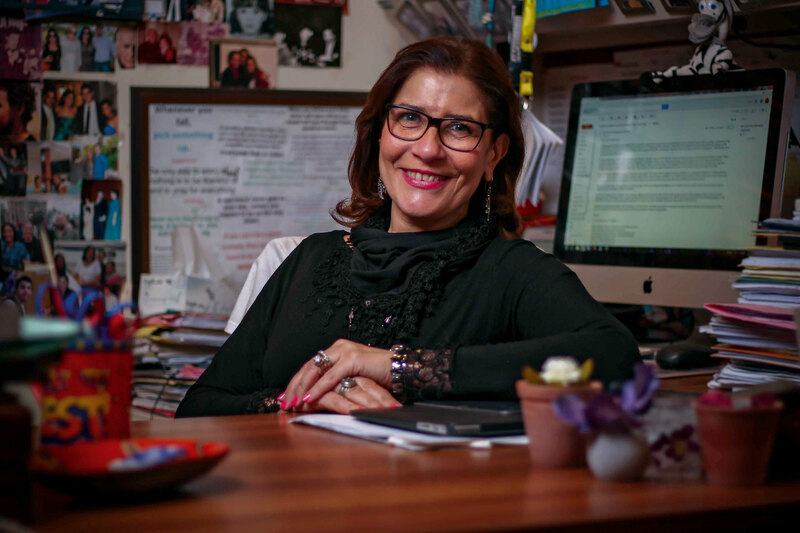 After singing with her siblings in the 4M, the musical band led by her brother Ezzat Abou Oaf from the 70s to the 80s, she dramatically changed course and became a Professor in the Department of Journalism and Mass Communication at the American University in Cairo (AUC). Her energy, charisma and heart of gold, have been a valuable asset to every phase of her career. eniGma’s Engy Aly sat down with Abou Oaf to find out all about the 4M, her family, and her academic career. Tell us about your life transition from a singer in the 4M to professor at AUC? First of all, I was so lucky to be a member in the family group, the 4M, because you can’t imagine how much fun it was. It was never work for us. Even when we were all married with children, we still had fun with the group. It was never a hindrance. We kept at it for 11 years till our children got to school age. At that point, we had also started our acting careers and performed in plays. Theatre is a very different kind of commitment; there came a phase when I did not see my son due to my hectic schedule at the theatre. As tough as it was leaving the band, I would do it all over again. But I was the last one to leave the band actually, and I always tease my family about that. Are you still as close to your siblings as you were during your time in the 4M? Of course; we are lucky. We’re still as close as we were and we still meet on a weekly basis. And of course, our brother Ezzat is our icon, so when he was misdiagnosed and was ill for a while, we were all very close to him to the point that we were bugging him. At the end of the day , it’s a blessing that you have people to take care of you and these people know you inside out. You have had several careers. Which one allowed you to grow the most? I don’t think I’ve grown enough yet. I mean, every time you think that you’re content or that’s it, you realise that there’s so much more you can do, so much more you can learn. Learning is an endless process, and enjoying the process of learning is what makes me feel very lucky to be in this career. What advice would you give to a woman searching for the career that fits her best? It has to do a lot with the educational level of the person. She has to be passionate about what she does. If you’re passionate about what you do, you excel at it. And don’t be surprised to realise that you’re good at something that you never thought you’d be good at. Not in my wildest dreams would I have ever thought that I could teach. I always loved education, but when I was a student I never thought I would become a professor. So what brought you to this decision? I stayed home for two years to see what I could do, and I kept asking myself how I could be there for my child and at the same time do something useful. So I thought of teaching. My husband suggested that I go back to school so I came to AUC for another master’s degree. I became a teacher’s assistant for a while and then I took a class on teaching English as a foreign language. That’s when I fell in love with teaching. So I started teaching in the English studies division, and the feedback was surprisingly very positive. After a while, I felt that teaching the English language was very rigid and does not change over time. I thought of mass communication which, as we all know, changes by the second. I think teaching and performing are very close, so the switch was very natural. To become a good professor, you have to know the subject that you’re teaching, be passionate about it, eager to convey a message and always be prepared. Preparation is the key to any success; it’s the same thing for a performance. You need the same combination to succeed. The only difference for me is that I don’t have my family with me when I’m teaching in class! You’re known for being very empathetic, helpful and nice to your students; where do you get that from? I think it’s because of the sincerity that I feel towards the students. I really feel like I owe them. I feel it’s my duty and responsibility to facilitate matters for my students. There are so many difficulties out there, so I try to make it easier on them. People say that part of it is because I’m a giver, but I believe that I’m a taker not a giver, because my students are my source of happiness. As a professor, and previously the Chair of the Mass Communication Department, is it easier now to balance motherhood and your career? It’s easier now because my son is grown up. He’s 27 years old. He is the one pushing me away now, not the other way around. He’s doing so many things; he’s an audio producer and an audio engineer. He’s also into acting. When he was in school, my worst memories were of trying to help him in his studies. You’re not as tolerant when teaching your own son. Here I am teaching a whole generation and I didn’t know how to do the same thing with my own child. However, I’m very happy with our relationship. I think of him as a friend much more than he does, which is okay. It’s different between a mother and a son; it’s unlike a mother and a daughter. Do you believe your career goals have changed after becoming a mother? Of course they have, and to the better not to the worse. You don’t realise how marvelous motherhood is until you see your baby. What you thought about motherhood is completely different than actually being a mother. What do you think are the characteristics of a successful working mother? Tolerance, dedication, commitment, passion and most of all realising that you don’t know it all, because it is an endless road. Even though my son has grown up, there are still a lot of things that I’m trying to keep up with, including social media nowadays. The most important thing is the desire to keep on learning and growing. Well, we’re being offered a talk-show program as the 4M, but it’s a shift from what I’m doing now. I’ll definitely keep on teaching, because I’m very much into that. I’ve also been offered to do some sort of reality show about academia, which is very intriguing. So I’m in this kind of phase where I don’t know what to do or where to go. What is concrete for me is what I do here. My students give me the desire and the energy to keep on doing what I do now.